How Robyn Found Herself In The Space Between The Notes After eight years away, Robyn's new album Honey has fans asking where she's been. The answer, as the Swedish singer tells NPR's Ari Shapiro: dancing her way to emotional clarity. "Club music and dance music really require a different way of listening. You're not waiting for the chorus: You kind of have to like where you're at." Robyn's latest album, Honey, is out now. 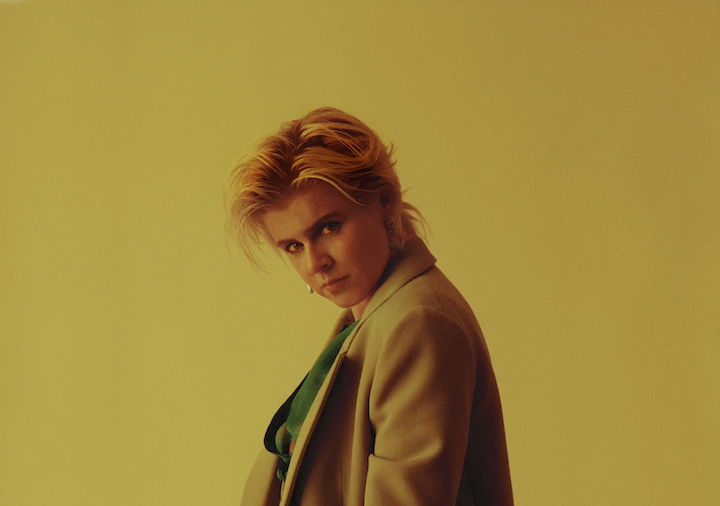 This summer, when Robyn announced the lead single of her first solo LP in eight years, the song's title — "Missing U" — read like a loving wink. The Swedish pop singer had not been entirely silent since Body Talk, the 2010 album that took her from cult favorite to superstar, whose singles and videos were referenced on Girls and parodied on Saturday Night Live. But to the fans in thrall to an artist whose work could make you dance and cry all at once, eight years without a full-length statement felt like a lifetime. While her music gave listeners a soundtrack to navigate heartbreak and loss, Robyn was going through a personal upheaval of her own: the end of a relationship, the sudden death of her longtime collaborator Christian Falk from pancreatic cancer and an extended period in intense psychotherapy. Those experiences provide a baseline to her new album, Honey, released on Friday. From the opening notes of "Missing U," written partially in the wake of Falk's death, the familiar threads are there: dance and despair. But there's also plenty that's changed. Robyn joined NPR's Ari Shapiro from the BBC's studios in London to discuss the making of Honey, hearing the music of her youth with new ears and why letting go of some control has helped her grow — both in life and art. Hear the radio version at the audio link and read more of their conversation below. Ari Shapiro: I asked people on social media what questions they had for you, and overwhelmingly, the answer was, "Where have you been?" Can you tell me a little about what the last eight years have been like? Robyn: When I got off tour the last time, I started making music right away. I made a Röyksopp EP. I made this EP with Christian Falk and one of the people in my band, Markus Jägerstedt, for a band that we had called La Bagatelle Magique. I collaborated with Kindness and with Joseph Mount and Metronomy. And I also made a disco EP with my friend Mr. Tophat. So I kept myself pretty busy. But I was planning, or at least starting to write songs, for something that I wanted to become my next album. I knew that I wanted to loosen things up a little bit and really dive into my love for dance music, and the things that I really enjoy about listening to dance music and clubbing for so many years. But I didn't know how to make an album out of that, and I felt like I needed to just learn more about it. I didn't really feel like I had the tools to make that kind of music when I started to write. It's interesting that you wanted to use this album to dive into dance music — because when I listen to it, it sounds less dancey than some of your other projects. You left openness and space and room, rather than filling it with danceable beats every moment of every song. I guess that depends on what dance music is to you. To me, dance music is a lot of space — to listen to other things than melodies. I think club music and dance music really require a different way of listening. You're not waiting for the chorus: You kind of have to like where you're at, at the moment. It's about finding your groove and letting whatever's happening in the music rhythmically guide you. Square, yeah. And so I think on this album that's loosened up a little bit. Yeah, I think of a track like "Between the Lines," which is very syncopated and has almost a '90s feel. I imagine a drag queen strutting down a runway when I listen to it. That feels very different. To be honest, when I think about making this album, I wanted to dive deeper into things that have inspired me throughout my life — but also, personally, I was in therapy. And I wanted to dive deeper into my personal growth, as well. So I wanted to mix this other way of listening to music, that I think comes from clubbing a lot, with what I was experiencing in therapy: letting go a lot of control, getting to know my own consciousness a little bit better. I feel like you're reciting the lyrics to the title track, "Honey," right now. The themes you're describing seem very similar to the idea in those lyrics: "Down in the deep, the current is stronger." What I'm trying to say is that if I really try to remember the feeling I had making this album, I was in a space where I couldn't go back: I didn't want to do what I did before. But also I was kind of sad, and I couldn't push through and work with the kind of force and energy that I had worked with before. I didn't feel like making music. I just wanted to, I guess, soothe myself — and that's how the music happened. I did things that made me feel good, that made me feel better, like dancing to things that I really like. They're not things that you can explain or theorize — they just happen when you hear something that makes you want to dance. It's a very strong and particular feeling. And a lot of the music that I went back to, like pop music I grew up with during the '80s, it was almost like I was listening to it for the first time — because I was raw and kind of rearranging things within myself. Like "Don't Stop 'Til You Get Enough," with Michael Jackson, was one of those things that I danced to a lot. Even the music that I knew very well felt very new to me. People have been so excited for this album to come out, and it finally dropped on Friday. What has it been like since then, for you? I've never released an album that has received so much love and praise the way that this has. When you make something that you really like, you're not as dependent on what other people think about it — but for me, releasing this album after a long time, and doing something where I feel like I've shared a lot of my personal experiences, I felt very vulnerable. So of course it's an amazing experience to have it received the way it's been. I'm really happy. Your fans have a very intense relationship with you. I'd like to read an email auto-reply that a friend of mine put up last week: "Thank you for your email. I may be unable to respond on Friday, Oct. 26. My heart is being destroyed by Robyn's new album, Honey, and I will do my best at pulling my s*** together." ​What's it like to be on the receiving end of that intensity? Amazing, of course. I listen to music very intensely as well: When I listen to an artist I really love, I feel like I know them. I feel like I understand what they're thinking about, even though I've never met them or talked to them. As a kid, I didn't know much about Prince — who he was and all the complexities of his personality — but I could still feel very close to him when I listened to his music. And that's what I think is amazing about music: You don't need to know anything about the person who made it, because you get to know them through the little details and the nuances and the dynamics. If you're sensitive to it, it's a very direct kind of language. So it's really nice for me to have fans that listen in that same way. The album ends with the refrain, "I swear I'm never gonna be brokenhearted ever again." Is that a hope or a promise? Or a delusion? I think it's up to you. I don't feel like I have to interpret it: I wrote it thinking that it's open to both outcomes. Your heart is definitely going to be broken again, sometime in your life. That's very hard to avoid. But maybe the song is about defiance or how you decide to deal with it, more than actually predicting the future. You said that music helped make you feel good again. And when I hear from your fans on social media, so much of what they say is that now your music, whether it's "Missing U" or "Dancing on My Own," is serving the same function for them. Well, I think that's what music does. Music doesn't change the world — I really don't believe that's the purpose music should have. But I think music gives people a break, where they can recharge and then maybe change themselves. Which is beautiful.